Hi! My name is Winchester and I am such an exceptionally affectionate and loving boy that the rescue folks keep telling me that I am filled with honey and marshmallows! Hi guys!! My name is Grover. I am a super happy, excited, curious, playful, friendly puppy looking for a home with people with big hearts!! I may only have three legs, but I am !SUPER GROVER! and am not letting it slow me down one bit! Let’s play! Good with kids? Older kids, 8 years or older! Medical notes: Grover was hit by a car a few months ago and suffered severe nerve damage in his leg, necessitating the leg amputation. 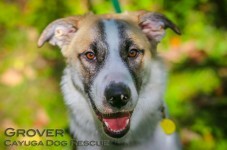 Seems like it was the right decision, because Grover couldn’t be happier and more mobile! He is a hilarious pup and a true lover! Supported in part by the Triad Foundation.